Shakti Kumaon includes both the Shakti Kumaon Himalayas Village Walk as well as our award winning lodge, Shakti 360° Leti. These experiences, located in the stunning and lesser known region of the state of Uttarakhand, can be experienced separately or combined to create a unique Himalayan journey. A little known region known as Kumaon Himalayas lies in the northern hill state of Uttarakhand, promising some of the most stunning mountain scenery in the world from the perennially snow-capped peaks of the Great Himalaya range in the north, to the pretty hill stations at its foothills. Lucky to have escaped the influx of backpackers common in other hill areas, in Kumaon Shakti has been able to pioneer the concept of village walks in an unspoiled, offbeat part of India. In this captivating region of the Indian Himalayas, Kumaon boasts its stunning scenery, while we're proud to be able to organise Kumaon tours and trekking holidays for those lucky few that choose to come along and experience true freedom. 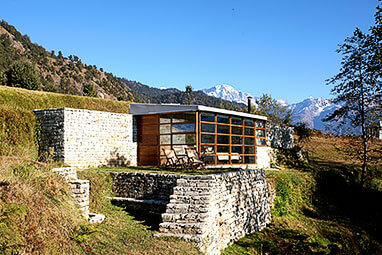 nights, taking in 3 beautifully renovated villages houses located in the Almora region of Uttarakhand. Days are spent trekking Kumaon in a remote and beautiful region, in an area known for its gentle people, lush surroundings and sweeping views of the Panchachuli Himalayan range. Located 5½ hours drive north of the Shakti Kumaon Village Walk, Shakti 360° Leti offers a one of a kind mountain experience. With only 4 bedrooms, outstanding cooking & service, exceptional Kumaon trekking tours & space to relax and take in the truly astounding sights Kumaon Himalayas has to offer. Designed with sophisticated simplicity and style. between Kathgodam/Pantnagar and village houses and Leti. before or after the stay at Shakti 360° Leti can be extended for a more immersive experience. 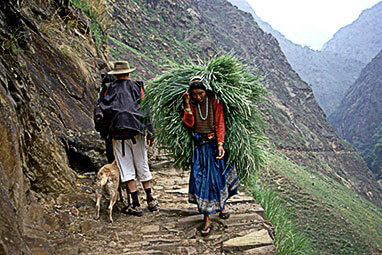 Almora region (3½ hours away) from where the Village Walks will begin. En route you will stop for lunch. for about 2 hours to reach your first village house in the small and sleepy town of Deora. Setting off from Deora, you will walk for thirty minutes towards the village of Chirala where you can visit the local school. terraced fields through the village of Palyu, before climbing for twenty minutes to the road head at Ka- Chula pool. gradually uphill through stunning rhododendron forest for around 1½ hours until you reach the village of Jwalabanj. Temple Complex built in the 8th century, which is very interesting to explore. We will organize a picnic lunch at a lovely spot nearby. There is an additional walk through the forest for those who are more energetic, or you could be driven directly to your village house. dishes, like Momos & Biriyani. in a pashmina blanket with a book from our collection or play a board game. this land from the campsite, and it offers a fabulous sense of achievement to reach this area. the most amazing blanket of stars over head. This morning after a leisurely breakfast, you will be driven 5 hours to the village of Kana. take a beautiful hike in this area. at 1535 hrs and arriving into Delhi at 2105 hrs. There is an Air India flight operating four times a week on; Tues/Weds/Fri/Sat (Pantnagar to Delhi). between Kathgodam station/Pantnagar airport and village houses and Leti. stay for you and what to do while you are with us. village of Jwalabanj and enjoy a leisurely evening. to Shakti 360° Leti. There will then be a walk of 5 minutes to the property. This morning after a leisurely breakfast, you will be driven 5 hours to Kana. Enroute, you will have the option to visit the main town of Almora. Visit the Panchachuli Women’s Factory - founded in the late 1990's. For those of you who wish to walk more, there is a beautiful hike near Kana. This morning after a leisurely breakfast you will be driven back to Kathgodam Railway Station for 4.5 hours for your journey back to Delhi.You will board your train (Shatabdi Express) departing at 15:35 hrs and arrive into Delhi at 21:05 hrs. Alternatively you could take the flight from Pantnagar to Delhi. There is an Air India flight operating four times a week on; Tues/Weds/Fri/Sat (Pantnagar to Delhi). houses. Train & Flights not included. prepared by your chef this evening. for around 1½ hrs until you reach the village of Jwalabanj. This morning after breakfast, you will gradually climb up the south-west ridge, walking on the trails that were once used to transfer resin on horse backs, which now still is a boost for the local economy. In an hour and a half, further down the ridge you will start descending to Artola village. You will walk through the terraced fields and will reach your picnic spot which is laid on a hill top. After lunch, you will continue to walk uphill through the village of Kutul. Upon ascending this ridge, you will then take a small trail that will lead you to back to Jwalabanj. This morning after breakfast, you will start with a downhill walk through green terraced fields brings you to the Jageshwar Temple Complex built in the 8th century, which is very interesting to explore. Some distance ahead we have arranged lunch for at a lovely spot by a stream. Another hour further you will reach the village of Kana. For those who wish to walk more, there is a beautiful three hour walk from the house through rhododendron, pine and oak forests. The post monsoon months of October and November offer lush scenery and clear views with warm sunny days and nights that are getting increasingly colder. In December and January it becomes very cold at night, however the days are still warm and sunny and offer the clearest views of the mountains. From February, both the days and nights start to get warmer and between March and end of April, the rhododendrons come into bloom. Being the Himalayas it is possible to experience a full span of weather in a single day - from bright sunshine that requires a high SPF and a sunhat, through to a rain storm that calls for a light waterproof jacket in one’s day pack. Overnight train (7 hours) from Delhi to Kathgodam followed by a 3 ½ hour drive to Almora, where the Village walks begin. Day train (5 ½ hours) from Delhi to Kathgodam followed by a 3 ½ hour drive to Almora. where the Village walks begin. Drive (9 to 10 hours) from Delhi to Almora. We do not recommend this option as the traffic in and out of Delhi can mean long delays and the route is not very scenic. Flight from Delhi to Pantnagar (1 hr), followed by a 4 ½ hour drive. It operates only Tuesdays, Wednesdays, Fridays & Saturdays. Private charter flight (1hr 15m approx) from Delhi to Pantnagar, followed by a 4 ½ hour drive. Drive 9 to 10 hours from Rishikesh to Almora with The Corbett National Park being around half way and making a good stopover. Overnight train (7 hours approx) from Delhi to Kathgodam, followed by an 8 hour drive to Shakti 360° Leti. Private charter flight (1 ½ hours approx) from Delhi to Pithoragarh, followed by a 5 hour drive to Shakti 360° Leti. Please check with us regarding this option as the Pithoragarh airstrip is not functional at the moment. Drive (5 ½ to 6 hours) from Almora to Shakti 360° Leti. Please note that Leti is around 6 hours drive from Kana and Jwalabanj village houses and Deora is around 5 ½ hours away. There will then be a walk around 5 minutes to the property.